We first chose our three Nigerian Dwarf female goats, called does, from a local woman selling hers. Sushi, the mother goat, and her two doelings came to us all together. I knew we wanted milk so would need to breed the females in order to begin that process. The hunt for a male was similar to our earlier search in that we looked at online Facebook goat groups, livestock ads in the paper and Craigslist ads also. We found our Herdsire on a Craigslist ad from Narrow Way Farm which is about an hour away from us. After doing research on how to disbud, or remove the horns, on a young goat, I knew that vet care to do that would get expensive quickly. We want to use the goats for show which means that they may not have horns. It is also safer for me when handling the goats for their care and milking to not have the horns to contend with. Thankfully the O’Keefe family had begun the process of creating a herd with the genetics that carry goats that are polled, naturally born without horns. ale from the few that they had available. Jim quickly became the obvious favorite as the babies climbed all over him. The buckling that we chose was a polled, blue-eyed, almost entirely white ball of goat energy. He had characteristics that we wanted. The ability to have his offspring not have horns, blue eyes and he carries black and brown on his predominantly white self. The herd was tested clean for diseases common in goats, the goats were fully registerable and the family selling him had similar goals like us. It felt like a really great match. 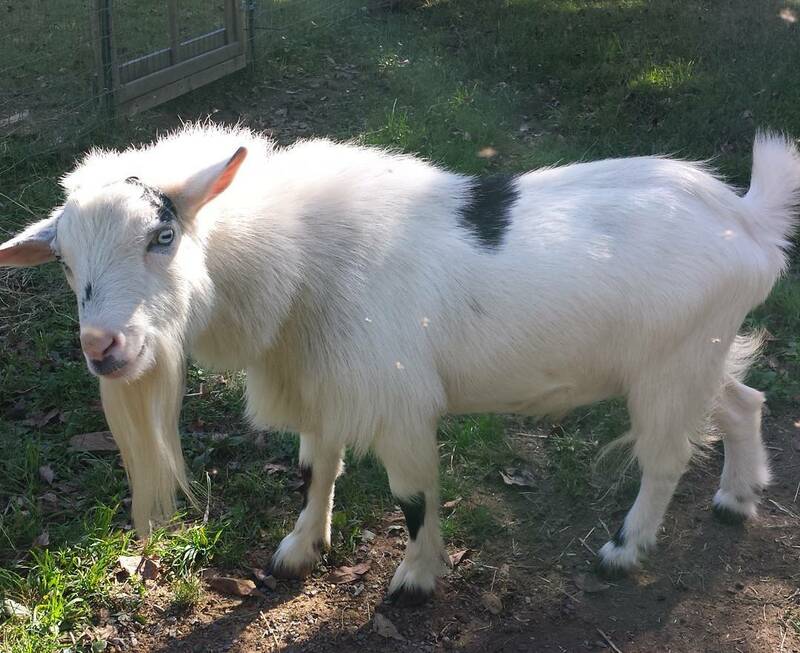 Some of the information that I learned was gathered from books and websites, A few of my favorites are specific to Nigerian Dwarf goat colors and other are about Dairy goats, which Nigerian Dwarf are. Now that Mattis is almost 2 years old, I can look back and say that he is really doing an excellent job being our Herdsire. He is a stinky buck but that’s his job. He knows how to put on the stink to impress his ladies. Is that a bit much? Mattis earned his name from a living legend, USMC General James Mattis. My husband Jim is a USMC veteran and proudly names all our males by either Marine or Army leaders. In our pasture we have 2 wethers, castrated males, named after Army Generals Dwight D. Eisenhower and Douglas MacArthur. him home. The girls beat up on him a bit, but we fed him separately and made sure that he was ok during that transition time. Mattis quickly outgrew that collar! If we look at how are the genetics doing, then I think I would admit to needing to do a better job of keeping record of who is polled and who is not. Lessons for me to employ for 2017. Just looking at the chart I quickly did, I would say that it has been worth it to find a polled buck. I look forward to seeing the many colors and combinations that happen for each kidding season! Below is Dalai, Mattis and his two sons, Dwight and Doug wondering why Tommy is keeping the gate closed.